The teams are closer to their 2017/18 selves than they seem. Atletico Madrid’s 2-0 victory at home was the first game that Borussia Dortmund had lost all season. Bayern Munich lost their first match five weeks ago. 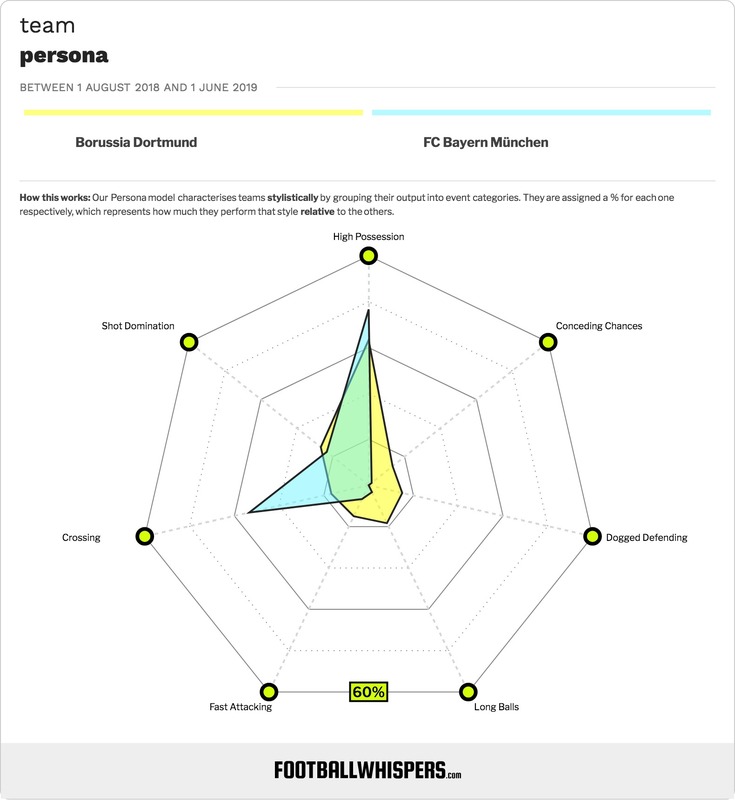 Things are a little closer in the Bundesliga now than they were not too long ago, when Bayern were lying in sixth-place, but this weekend’s Klassiker is still a seismic clash. Our friends at Football Whispers are here to explain how the two teams got to their current position, and how the match might go. You could argue that any team who is ok with not being top dog is one who has been there before and knows they will be there again. That is why Bayern’s relative struggle this season has been so eye-catching – they’re always on top. The ‘struggle’, though, has been slightly overblown. Bayern may have drawn two and lost two of their ten Bundesliga matches so far this season, but three of those poor results came in a row, as September turned into October. Since then, they’ve won five out of six in all competitions. They’re also much the same team in terms of their performances. This season has seen a marginal uptick in shots taken, and if you use expected goals to look at the quality of those chances then there’s little change on either attack or defence compared to 2017/18, when they walked the league. What changed? A little bit of trouble finding the net, and a little bit of improved opposition. “The last two years were not too good,” Axel Witsel has said. “Now, Dortmund need to perform again like they used to, and that’s what we’re doing. To say they started very well is an understatement. Dortmund started the season with a club record 15-game unbeaten run across all competitions, and no team does that without getting a bit of the rub of the green. But Dortmund have vastly overshot their expected performance in attack. Their chances from open-play have been worth just a little over 18 expected goals; they’ve actually scored 28 from these shots. “We must focus on improving our game, play more confident football again,” was Hoeness’ diagnosis. Hoeness might be using a bit of artistic license — Bayern are valued at 2.50* to win the match by FansBet — but he’s right that it will be a closer match than previous years. Their last meeting, in the league last March, ended in a 6-0 win for the Bavarians. Robert Lewandowski is Bayern’s top-scorer so far this season, with five league goals, and he’s 1.62* to score anytime during the game. 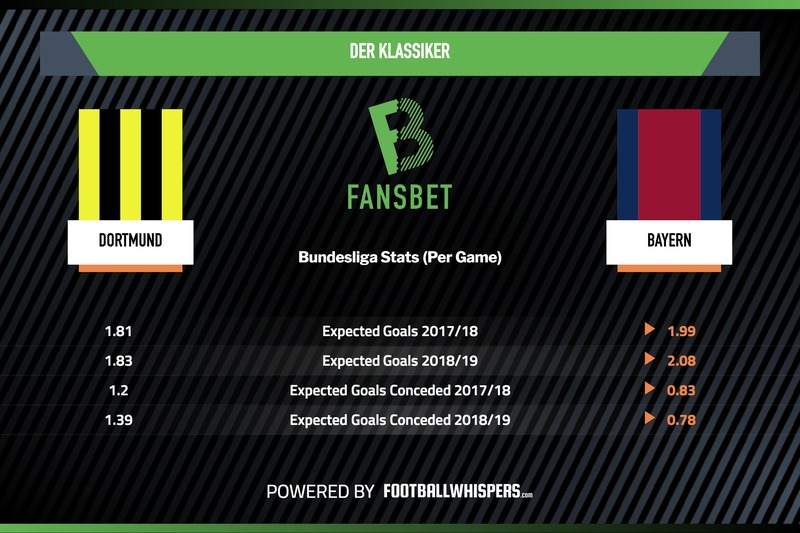 Goals could rain in on both sides though — both teams have conceded a goal per game in the Bundesliga, or more, and both teams to score in this game is priced at 1.57* with FansBet. The two teams are closer to their previous selves from 2017/18 than the narrative would have you think, but this game will still be seen as a symbolic turning point in the title race, whatever the result.